In deliberation with George R.R. Martin we have decided to re-release some old book licensed items. We have been saying for a number of years now that we would look into doing this once the show ended, and it ends in two months so now was the time to start. We have never wanted to devalue the original items, it is important to us to strike a balance, so we are not numbering these new second editions, and they will not come with GRRM’s autograph. It is our hope that this preserves the collectability of the originals while allowing new customers who may not have known we existed 10 years ago to buy these old designs. The first two we are doing are King Robert’s Warhammer and Book Longclaw. The Warhammer will start shipping within a week, Book Longclaw will take another 6 weeks or so before it starts shipping. The Red Viper’s Spear has gotten in stock within the past week and is shipping now. If you haven’t ordered one I would do so, it is really nice. Red Damascus Oathkeeper (book license) is back in stock after a brief hiatus. Euron Greyjoy’s Axe is also coming soon, around the same time as Book Longclaw, ~6 weeks. The last remaining new item on the docket for 2019 is Heartsbane, we hope to start taking preorders on that item in May or June for deliveries 3rd or 4th quarter 2019. It will be in both damascus and stainless. Speaking of damascus, Oathkeeper Damascus (show license) is all but sold out with less than 10 remaining. We are pleased to announce the newest product in our line of licensed collectibles from the HBO® series Game of Thrones®. The Red Viper’s Spear is made from high quality stainless steel and cast metal handle parts. It was modeled directly on the actual screen used prop from the show, with accurately matched materials and dimensions. It is a limited edition of 2500 pieces and will come with a certificate of authenticity and wall plaque.The Red Viper’s Spear will retail for an MSRP of $330 and we will start accepting preorders on Saturday August 11th at 12 Noon Eastern Time for 1st Quarter 2019 (estimate subject to change) deliveries. We are very pleased to announce the hotly anticipated Oathkeeper Red Damascus through our book license. Oathkeeper is forged from the melting down of Ice at the bequest of Tywin Lannister, and he has the smith add his family color to the blade. These unsharpened collectible book replicas were designed with the personal input of George R.R. Martin and each set comes with a certificate of authenticity bearing his autograph. They are made of real high carbon layered damascus steel with a patina treatment to achieve the red and black design. Preorders will open Saturday September 17th, each sword is $500. We are very pleased to announce the first book licensed product through George R.R. Martin in a long time: Daario’s Ladies! Daario Naharis is a sellsword in the service of Daenerys Targaryen and his weapons are as notorious as the man himself. These unsharpened collectible book replicas were designed with the personal input of George R.R. Martin and each set comes with a certificate of authenticity bearing his autograph. The backorder for Ice will be ending around the week of September 20th. 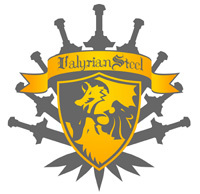 The preorder for Needle’s Scabbard and Oathkeeper’s Scabbard will be ending around the week of September 15th. Longclaw is rapidly running out of stock again, it isn’t on backorder quite yet but it will be before the next shipment arrives, which is mid-October. 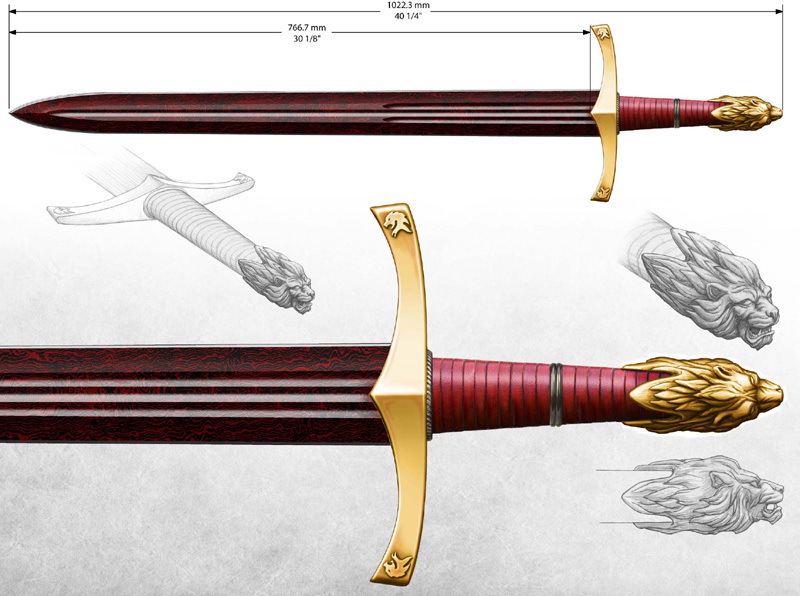 Longclaw’s Scabbard is currently on backorder, and we hope to get more the same time as the next Longclaw shipment, but that is not yet confirmed. The preorders for Book Oathkeeper Damascus ($500) and Book Daario’s Ladies ($350) will open soon. We’re moving our warehouse from Michigan to Chattanooga, Tennessee, this will affect order shipping times for orders placed the 15th-22nd of July. Our new location will have a nice proper showroom should any customer want to visit in person, way better than our current warehouse. While cleaning and packing we found the Night’s Watch Dragonglass Dagger Set Prototype! 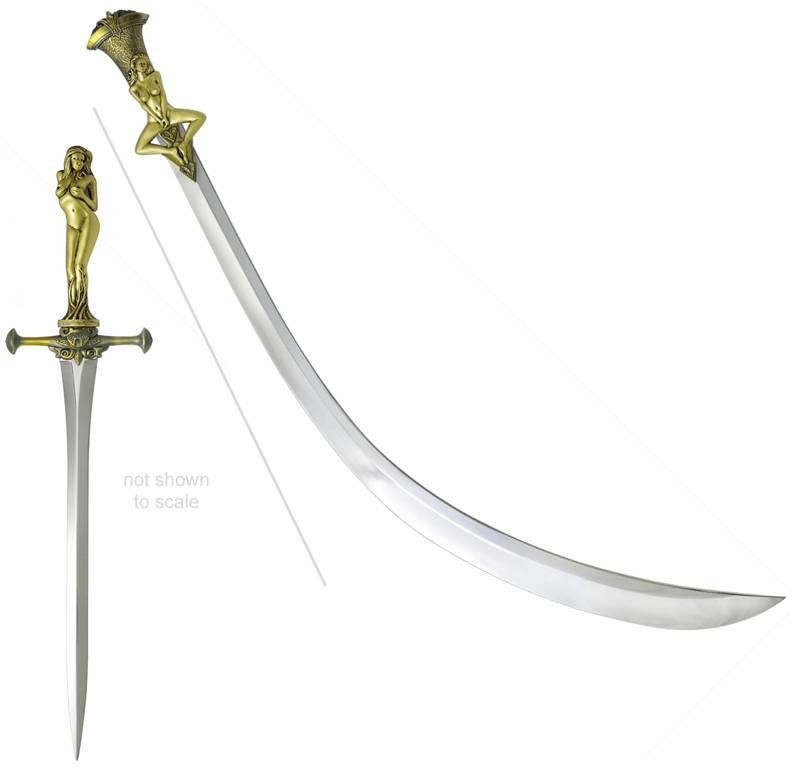 One of a kind, this is the exact knife we sent to GRRM for his personal handling and approval. We put it up on ebay. Bid early and often! Oathkeeper Damascus should ship in early to mid September. Robb’s Sword recently sold out, sorry, you can still find it elsewhere, but our warehouse is empty of Robb’s. King Robert’s Warhammer is almost sold out, we have like 10 left, and those will be gone in a day or two.